One of my lingering questions wonders why the intensity of the hippie experience didn’t flower more fully in fiction. Yes, I know hippies were considered “laid back” and “mellow,” but that’s only part of the picture. A lot of what we felt was indeed incredible and new. Yet while the music of the era gives both lyrics and a soundtrack to the late ’60s and early ’70s, the literary parallel runs thin. Most of the prose is in the non-fiction side of the aisle – memoir, especially, and sociology – works like Barry Miles’ Hippie. Within that flourished a range of small publishing operations, such as Straight Arrow Books and Ten-Speed Press. But novels are another matter. As I’ve already noted, Richard Brautigan and Gurney Norman (Divine Right’s Trip) did give wondrous voice to the action. Add to that Maxine Hong Kingston’s Tripmaster Monkey, T.C. Boyle’s Drop City, and we’re soon at the fringe. Thomas Pyncheon’s Vineland, Lisa Mason’s Summer of Love, and Jan Kerouac’s Baby Driver get nods. I’d add Edward Abbey, Tom Robbins, and John Nichols to the list. And then? Well, there’s always my Freakin’ Free Spirits cycle at Smashwords.com. All four volumes. That, I suppose, is the entire point. We came so close to a real revolution across the social and economic spectrum. That vision needs to be kept alive and rekindled. Especially in the face of today’s repressive regime. As I blogged during the summer of 2014, the No. 1 topic of discussion across much of New England concerned the dramatic battle for control of the Market Basket supermarket chain. In an unprecedented reaction to moves by one-half of the family owning the company to sell the popular stores to more expensive rivals, its management, devoted workers, trusted suppliers, and loyal shoppers united to bring the enterprise itself to a halt. A grinding halt. And it worked. After months of earlier rebuffs and daily headlines, the part of the family actually running the stores announced an agreement to buy the entire operation from its hostile relations. It was a complicated story, with some long-festering feuds in the not-so-recent background. The kind of story that’s bound to show up as movie adaptations. Maybe even as a television mini-series. Maybe not Dallas in Boston, but as rich in its material. We’ve been waiting for the book-length analyses, and the first one is finally making the rounds: We Are Market Basket (the title comes from a slogan at the time) has been published by an American Management Association affiliate. Authors are frequently advised to “know their audience,” with the implication of tailoring their work to assumed demands. In this case, the book can be seen aiming at two audiences: New Englanders who remember the revolt and likely participated in some part of it, and then business majors and managers around the world. It’s both a strength and weakness for the volume. Reading the text, it’s easy to see which part was written by which coauthor: Lowell Sun newspaper reporter Grant Walker drafted the day-by-day narrative, while associate business professor Daniel Korschun provided the chapters on business management. It’s all good stuff, though a bit repetitive, as one might expect from daily news reports that have to recap earlier developments. And I started wishing Walker had more sources to draw on. Still, they underscore the point of their book. As the subtitle says, The Story of the Unlikely Grassroots Movement That Saved a Beloved Business, this was a remarkable event. Korschum uses it as a platform to argue for an awareness of stakeholders in a company – not just stockholders. It’s a theme Bernie Sanders has been pressing in his presidential campaign, and he’s not alone it saluting its importance. Workers, suppliers, and entire communities have investments of one sort or another in the companies that operate in our presence. For Market Basket, with prices typically 16 percent lower than its major competition, customers have a definite reason for supporting the stores, which, as it turns out, are remarkably profitable, despite or (as Korschum argues and others of us believe) because of their culture of contrarian instincts. You can read the book for the reasons why. The list of down-to-earth practices throughout the operation, where the lowest level workers are encouraged to find ways to improve the business, is worth the read alone. You won’t walk through any store quite the same afterward. My interest in the topic goes back decades before this, as I saw the operations of a smaller but similar grocery operation run by my then-girlfriend’s father. His own father had started out with a produce cart that went door to door. Besides, my own inclination has been for smaller, typically family, operations rather than monolithic corporations – as I demonstrate in my novel Hometown News and pursued for most of my employment as a journalist. As I was perusing We Are Market Basket, I kept thinking of business books like Tom Peters’ In Search of Excellence series. They’re fun to read and make their point, though there just might be more to the story. In this case, I definitely feel there is. Yes, when we come to the stakeholders argument, we can look to John Henry Patterson’s benevolent leadership at the National Cash Register Co. in Dayton, Ohio, or the glory years of the cereal makers in Battle Creek, Michigan, or Aaron Feuerstein’s moves in the aftermath of the Polar Fleece fabrics’ devastating factory fire in Malden, Massachusetts. Essentially, these provide similar models of enlightened leadership along the stakeholders’ ideal. But this book also leaves me wondering about the next generation after Arthur T. Demoulas’ leadership – he is, after all, pictured riding a white horse. So there’s a need for a management text on maintaining leadership a generation or two down the pike, which this book glides over as one of simply maintaining the historic company culture. There’s a lot of repetition on Market Basket’s culture in these pages, perhaps to drive the point home or, as I suspect, perhaps because of slack editing. But will that culture be enough? On another front, there’s a volume yet to appear that puts the Market Basket experience in perspective with other leader-defined companies. Yes, we love our heroes, but they’re hardly the stuff of corporate America these days. More often, they’re anonymous and invisible. What kind of executive would be needed to fill Arther T.’s shoes? And there’s another round of writings that might relate Market Basket to other family-owned companies and their survival or failure in moving from one generation to another. Family ownership issues have become a distinct subset of a business school curriculum. You don’t get fired from being a brother or a sister or cousin or grandkid — it’s a lifetime position. We Are Market Basket skims over the earlier family conflicts that erupted into ugly, protracted, and costly court battles only years before the events at the heart of this book. To understand the bitterness of the most recent round, I’d love to see a volume – or at least one more open to both sides – more detailed than what this one presents. Not that the other side made itself in any way sympathetic in the 2014 accounts. Even so, the events were not quite as black-or-white as they seem to appear. An astute reader senses the authors’ desire not to antagonize their sources, meaning the book’s told basically from one side. Another fascinating dimension also appears in corporate ownership that’s not quite split evenly 50/50. Television viewers may remember an episode of Ed Asner’s Lou Grant series where the newspaper was threatened by such a division – not that much different from the Seattle Times, actually, where one percent held the sway vote. When it comes to Market Basket, we have one crucial family voter who switched. Why? Everyone wants to know. So I’m still hoping for a more definitive volume than this entry. Maybe by the crack team from the Boston Globe, which could throw far more reporters at the story than the suburban Lowell Sun could – reporter/author Welker at least had the advantage of having the Demoulas family grocery stores originating in Lowell and putting their headquarters one town over, in Tewksbury, but he was a Lone Ranger in the face of a large reporting and editing staff in Boston. Another of the case studies waiting to happen would look at Market Basket since the uprising. Can it sustain the large debt load and still maintain its generous employee bonuses and profit-sharing, along with its low prices? A year-after report by the Globe found that the company is indeed prospering in its rebirth. But long-term questions remain. Will the fuller story ever come out? For me, more and more, I’m looking for another current example, somewhat the way scientists want an experiment that can be replicated — another stakeholder over stockholder victory. In the meantime, we’re still shopping – almost religiously – at Market Basket. than a case of whisky. My father left me both. 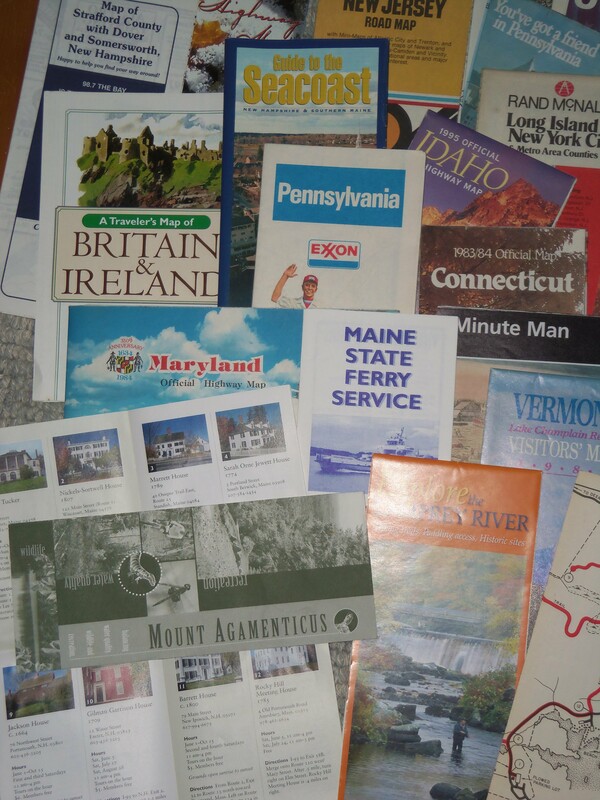 Like my younger one, I’ve always been fond of maps. My bedroom wall was lined with tacked-up National Geographic charts, which tended to sag in our humid summers. I was reminded of this the other morning when I was looking for a Boston street map, just in case I lost my bearings. Yes, I could have gone to the maps at Yahoo or Google. Even looked for the satellite views and all of the scary ability to snoop that goes with it. I couldn’t, though, use a GPS, neo-Luddite that I partly remain. Dover (0ne of a half-dozen varieties). Maudslay State Park in Newburyport, Massachusetts. Has a great stand of mountain laurel overlooking the Merrimack River. University of New Hampshire campus. Doctors Without Borders global view (two copies). Paul Revere House in Boston. New Hampshire (one of several varieties). National Geographic the Making of New England and another of Canada. New York City subways (two versions, three maps). York (Maine) Water District trails. They even take me places I haven’t yet been, as well as back to some old favorites. All without leaving the house. And that’s before we get to the drawer of topographical maps, especially those from my Cascades years. Or the books and atlases. Or the genealogical maps, Guilford County, especially in those files. Oh, the memories! And you want to tell me they’re obsolete? Fat chance! WHICH SIDE OF THE REVOLUTION? In drawing on the hippie era, I realize how many different strands there were to the movement. Mine happened to lead into a yoga ashram, and though we were drug-free and celibate, we were also at the crossroads of a lot of the hippie action. All of that’s reflected in my Hippie Trails novels. As I ponder the era, I also realize DL’s journey in those pages could just as easily turned toward underground violence, had he joined one of the cells of bombers targeting military research operations in frustration, and that version of the story probably would have had commercial publishing cachet. But to me, it would have been dishonest. Amazing how many different views there are. … Hippies to me were quite different. To me, it gave birth to great changes in our society. … I am quite thankful for … the back to the land movement and the Calvary Chapels churches that came to exist during this time. I came to know Jesus Christ in one of them. They also pioneered living a simpler life … showing compassion to others. Taking care of this gift that is our planet. The “hippies” in America, were great artisans. As a weaver, quilter, and knitter, I look back at this time and find myself inspired by the way creativity roamed free among this way of living. This is the side I wish to nourish and celebrate. And thank you, Mari and all the others, for sharing. Everything that’s transpired in the 28 years since I first drafted my novel Hometown News has made me feel prophetic. Now, of course, you have an opportunity to judge for yourself. I just wish it hadn’t taken this many years to become public. One thing I’d like to point out involves the initial experiment I used in constructing the novel. Quite simply, I wondered if I could build a computer-generated story – no matter how distasteful the premise itself strikes me in my self-identity as a neo-Luddite and fussy literary type. Maybe it was just some of the vestige of the scientist wannabe in me? Be that as it may, one thing I’ve observed over the years is how little we typically know of many of our coworkers. There might be a favorite phrase they repeat or a piece of clothing or a distinctive quirk. And that’s it, sometimes year after year. So that part was agreeable to the S&R structuring. As a technique, though, I’m afraid to report – or maybe more relieved – that the S&R by itself was insufficient. It did provide the core “bones” for the novel, but I did have to paint over much of it to make it more pliant and, well, human. All the same, I’m feeling vindicated. Maybe it’s a high tech revenge for what high tech is wreaking on the workplace and surrounding community. To check out my Smashwords ebook story, go to Hometown News. Back in the late ’70s I attended a weeklong interdisciplinary conference at Fort Warden State Park on Washington’s Olympic Peninsula, an event that remains a potent influence on my work and thinking. Organized by Sam Hamill, then of Copper Canyon Press, the Power of Animals seminar spanned biology, literature, anthropology, mythology, and more. Presenters included the writers Barry Lopez, Gary Snyder, Howard Norman (then just the author of a chapbook of poems called Born Tying Knots), David Lee, and an equally impressive slate of zoologists and botanists in an interdisciplinary examination of the dimensions of the animal kingdom. One highlight was a stage production from Reed College that relived some of the glorious Coyote tales of the Pacific Northwest. Now, with the release of my chapbook In a Heartbeat from Barometric Pressures at Kind of a Hurricane Press, I hope to return the favor. 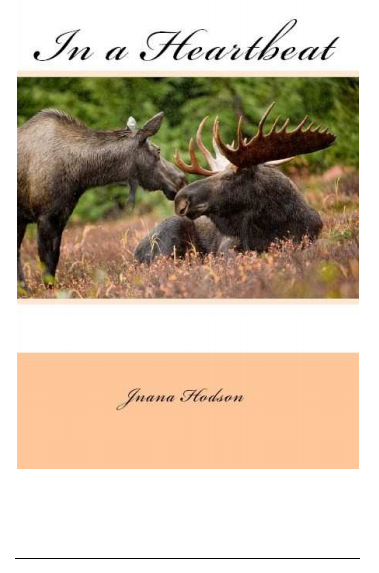 This set of poems runs playfully with wild and domestic animals of all sizes and influences as they impact our lives in real and imaginary ways. To join in, simply click here. And remember, it’s free. 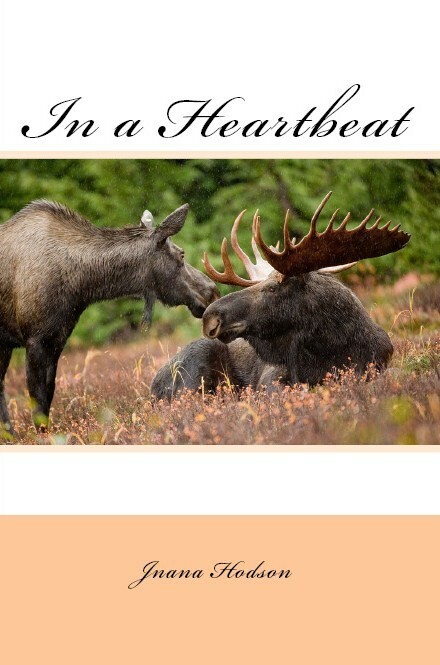 The Barometric Pressures author series at Kind of a Hurricane Press has just published In a Heartbeat, a set of 20 of my poems arising in the animal kingdom. As you can imagine, I’m delighted. Let me roar and crow, if you will. The set occupies a much different tone and style of my writing from what you’ve previously seen. It ranges from television cartoon characters to ancient mythology as it traces our interplay with our fellow animals across the earth, under the sea, into the air, and throughout our imaginations. This 35-page echapbook is available free from the Barometric Pressures author series at Kind of a Hurricane Press. If you decide to print yours out, you might even want to select a fancy paper to make your copy unique. Let me add, that way I’ll be even happier to autograph yours when we meet. But first, for your copy, click here.